That is sooooooo cool! I have never heard of peanuts in Coke! I love peanuts ... but mine would have to be a Diet Coke! LOL!! Loving your page!! So fun!!!!!!! Wow!! Good for you trying new things!!! Coke cake is so yummy too!!! Love the layout!! You didn't mention how the coke pineapple sauce on the broccoli was. I have never heard of a sauce like that? Can you expound on it a bit? Was it good? Did you put it over the top of the broc or did you cook it with the broc? Sounds interesting. It was ok, but nothing special. I sort of followed this recipe (http://mayflaum.com/2012/04/10/coca-cola-pork/) but added the pineapple tidbits with the juice instead of juice alone. I cooked it separately on the stove and served it on the side. Most people put it on their chicken and rice, but I liked it on the broccoli too. Those coke dishes sound amazing. I've never tried peanuts in Coke. But I'm not a fan of fizzy drinks. I love this challenge and reading about it on your blog! Way to go, Izzy, on finding a combo that you hadn't tried yet! 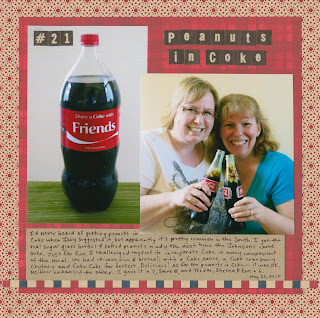 Peanuts in a coke I have never heard of either and I am going to the link you provided to read more about it! And I forgot to mention, Cindy, that I love the scrapbook page you made, too! Oh, yay! You tried it and you liked it! Your whole menu sounds tasty. I do love coca cola cake. Your layout is so cute. Love that you found a coke bottle that says you're sharing it with friends. And double love the traditional glass bottles for the peanuts. That's how it's done!